The Tornado Pro is Traser's finest Military Grade Professional Diver's Watch. 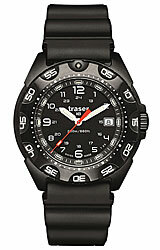 Traser watches are the world's standard in military timepieces. Built to meet and exceed the USA Military Specification, the Tornado Pro is the newest addition to an impressive line of tough, dependable watches that are ready for anything you can get into.